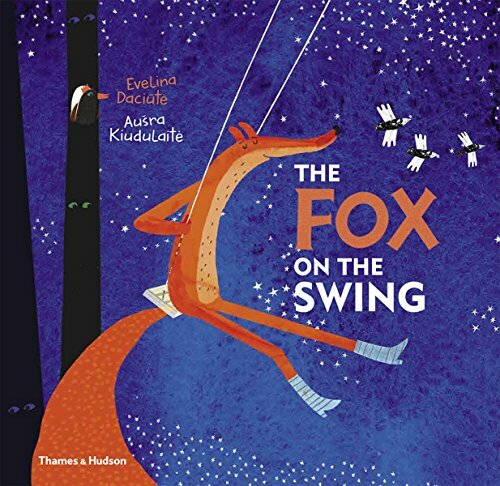 The Fox on the Swing is a boisterous hodgepodge of friendship, and, it seems, happiness, as perceived by the Lithuanian creative team of Evelina Daciutè and Aušra Kiudulaite. But really, that was the beginning because now the reader knows about the young protagonist, who really is a young boy named Paul, and there is no reason why the book should not have begun once upon a time, the way it initially began, other than to catch the reader off guard with a random shift. Random shifts, however, seem to be the norm for this story. Paul lives with his mother and father in a tree, in a park, on the edge of a city. There is a helicopter pad, of all things, on the top of the tree, from which his father operates an orange helicopter. Paul’s mother, incidentally, makes and sells orange colored pottery. Every day Paul makes his way to the bakery. On his way home he sometimes encounters an orange fox lounging on a swing. When he sees the fox actually swinging, he stops to make inquiries and a friendship begins. These erratic puzzle-like sayings, far from being irritating, appear to help Paul, who apparently has never heard such things within his own family, even though the reader will groan and want to tune them out. The fox, on the other hand, remains unaffected, immune to his own wisdom and haphazardly mysterious. Randomly, Paul one day asks the fox, “Will I always find you here?” Which seems startlingly out of place coming from the previous page, a fun-filled orange rendition of Fraulein Maria’s A Few of My Favorite Things: carrot cake, goldfish, and trees in the autumn. Apparently Paul doesn’t want this day to ever end, which of course it will, and fox has some preachy way of explaining that to Paul. Then, one day, father announces with eager fanfare that the family will move and things will be better. Better than what? Paul wants to know because his mostly orange things were all just fine. Paul has to break the news to fox and does so with awkward dialogue and more strange “advice” from fox. Paul, understandably, has trouble adjusting to his new, better, bigger home and misses having his fox friend to talk with. Paul makes his way around his new neighborhood and begins to get to know the sights and sounds, gradually pulling himself out of his lonely-homesick-blues transition phase. He meets the new baker, explores new paths in the park, sees fancy, big city birds, and finds himself actually having fun in his new surroundings. Then, lo and behold, there sits fox, on the swing in Paul’s new park. “I have missed yelling about what happiness is!” Which is, again, all things orange. Deep down, one could deduce, happiness is having a friend to spend time with. At least hopefully that is the message of the book, because otherwise the message is mixed, indicating that it is only objects, circumstances, moods, and the influence of others which make one happy or not so happy as whims may direct. But this is hard to tell as the admonitions to be morally upstanding are overwhelming. The storyline is a hard sell. It is wordy and clumsy at times making it a test of patience for the younger of the five to nine age range. Although it is fantastical and fairytale-ish, the real truths are buried, leaving the reader with an unsettled, wait-a-minute, what did I just read, sort of feeling. As strange as the themes are, Kiudulaite’s illustrations match up to and keep pace with the oddities of the characters. They are really the crowning glory of the project with inventive touches smartly placed on each page. It is the creative and bouncy artwork that will keep readers engaged and willing to carry on to the next page.